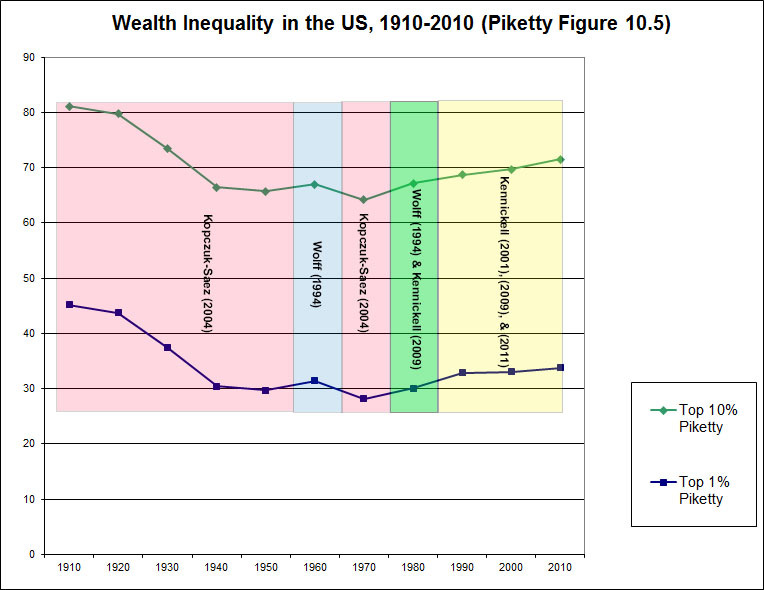 One of the main critiques I’ve made of Thomas Piketty’s data, starting on this blog last May and appearing in my newly released paper with Robert Murphy on the subject, concerns his Figure 10.5, purporting to show the trend of wealth inequality in the United States. 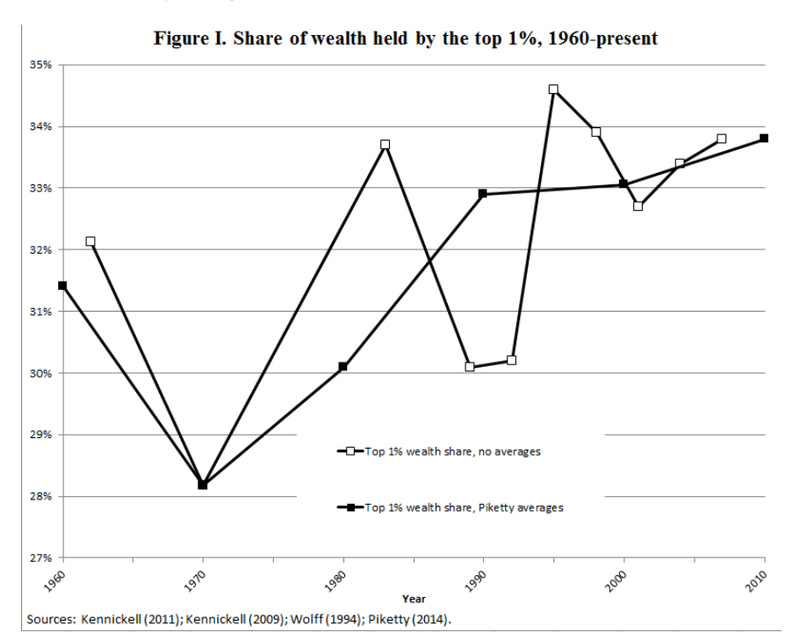 As I pointed out at the time, this chart suffers from severe distortions starting in the 1970s that come about from Piketty’s unconventional decennial averaging techniques. 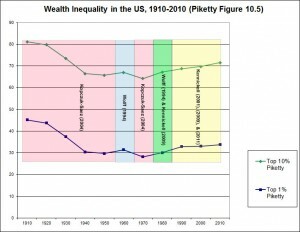 The result is a downward distortion that gives the appearance of a clear bottom point in 1970, followed by a steady increase in inequality through the present day. Piketty attains this composite trend by essentially cherrypicking from different data sources until he produces the story he wants to depict, even as the trend he claims is far more ambiguous in the raw numbers. Basically he uses an estate tax-derived estimate of US wealth distributions by Kopczuk & Saez (2004) until the 1960s, switches to a Survey of Consumer Finances (SCF) estimate for the 1960s from Wolff (1994), switches back to Kopczuk-Saez for the 1970s to create the depicted trough, and then lifts from two different sets of subsequent SCF studies by Wolff and Kennickell (2009, 2011) from the 1980s onward to create the purported upswing in inequality. The entire depicted trend from the 1970s forward is not a product of the source data, but rather Piketty’s picking and choosing between different sources in a way that yields the result his broader argument expects to find. They also perform their own reconstruction of the Wolff and Kennickell SCF data sources, comparing the raw numbers against Piketty’s unconventional decennial averaging techniques. The differences are stark. Piketty depicts the clean upward line (itself a product of “smoothing” caused by the decennial average), whereas Auerbach and Hassett’s raw data reconstruction is jagged with no discernible overall trend but lots of fluctuations. It will be interesting to hear how Piketty responds to the AEA session in the coming days, as it seems that the substantive problems with Figure 10.5 are starting to attract a fair amount of scrutiny.